Robert Campin was a renowned painter of his day whose workshop trained important artists such as Jacques Daret and Rogier van der Weyden. Together with Jan van Eyck, he developed a new way of depicting reality that completely departed from the International Gothic vision. The present portrait follows the new direction opened up by other Flemish painters in which the donors, who were previously shown as witnesses to the religious scenes taking place in the altarpiece, acquire greater importance and become the sole protagonists of the works. The sitter depicted here totally fills the pictorial space, standing out against a light coloured background that is reduced to the minimum. His features are painted with great detail and realism as the portrait was intended to be seen from close up. Hulin de Loo identified the sitter as Robert de Masmines and related him to a figure in a drawing attributed to Jacques Leboucz in the Recueil d’Arras, although that work bears little similarity to the present one. There is another version of this portrait in the Berlin Gemäldegalerie. During the course of the 15th century, advances made by Italian artists in the previous century were matched by further innovations in northern Europe, the second leading artistic centre. A new form of representing reality arose in what is now modern-day Belgium, the south of Holland and northern France. As in Italy, this approach took its starting-point from nature. The interpretation of their surroundings by these northern artists, who came to be known as Flemish Primitives, would be of a different type to that seen in Italy and reflected other aesthetic and technical criteria. The altarpieces executed by these northern artists played an important role in the development of the portrait as an independent genre. 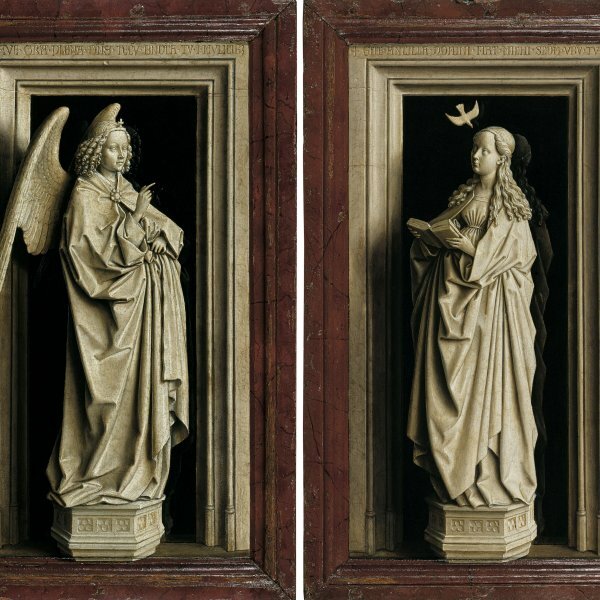 The figure of the donor acquired new importance and prominence in such altarpieces, whether painted alone or in the act of being introduced into the sacred narrative by an accompanying saint. Eventually, these donors and patrons came to be considered objects of artistic interest in their own right. Lastly, it should noted that within the genre of Flemish portraiture, Van Eyck was one of the great innovators. Portraits such as Man in a Turban (1433, National Gallery, London) and Cardinal Albergati (ca. 1431, Kunsthistorisches Museum, Vienna) depict sitters who have abandoned their role of pious donors to become the principal and sole motif of the work. 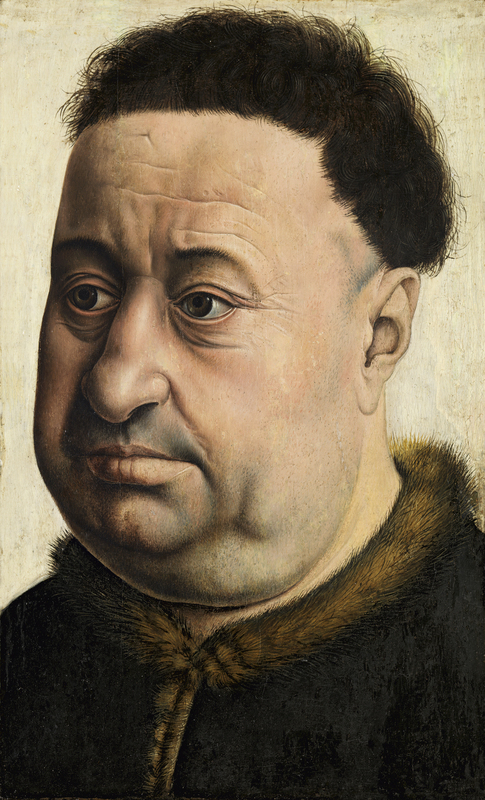 Robert Campin’s approach to the genre continued in this new direction. The present sitter, who has been identified as Robert de Masmines, fills the entire surface of the panel, emerging with enormous force and vitality from the limited background. The panel’s small format is ideal for a work intended to be seen from close up. The wrinkles on his forehead and around and beneath his eyes, the stubble, the pronounced double chin and the tiny points of trimmed hair growing around his ear reveal the artist’s particular gift for depicting facial details with astonishing realism. The sitter’s identity was investigated by Hulin de Loo, who related this sitter to a drawing of Masmines attributed to Jacques Lebouq in the Receuil d’Arras. Masmines was a member of the Order of the Golden Fleece and a distinguished Burgundian military figure in the service of Philip the Good who died at the siege of Bouvines. This identification is not, however, solidly based and has been doubted by other art historians who have emphasized the similarity between this sitter and the figure of Nicodemus in Rogier van der Weyden’s Descent from the Cross in the Museo Nacional del Prado. The features of the sitter in the drawing in Arras bear little similarity to the present sitter.Masmines’ prominent nose with its large bridge in the drawing is different to the long, straight nose of this sitter with its broad, pronounced nostrils. The mouths of the two figures are also different and the lower lip of the present sitter is more fleshy and pronounced than that of Masmines in the drawing. Masmines is also depicted in profile in a pendant now in Munich in which the shape of his nose is clearly comparable to the figure in the drawing. The present panel was not published until 1957. It was formerly in the collection of Count van der Straten Ponthoz, whose family were related to descendents of Masmines, at the château de Ponthoz near Huy in Belgium. The panel was subsequently in England until it was acquired for the Thyssen-Bornemisza collection in 1960. There is another version of this portrait in the Gemäldegalerie in Berlin. The two were exhibited together at the National Gallery in London in 1961. The existence of these two versions, both of high quality, has led to various suggestions as to their authorship, their date and the identity of the sitter.